Whether or not they privately agreed with Gourevitch’s assessment, Barber, Chenevière, and Keohane intuitively sensed that this was not the best way to begin a two-hour-long, ten-person panel discussion that was clearly and hopefully skewed toward the idea of Rousseau as a godfather of radical egalitarianism, a kind of White (wig) Panther avant la lettre. Of course, like any interesting person, Rousseau was a mass of contradictions in his life and thought, at one point even writing, “Forgive me my contradictions, but I cannot think without them.” To cite one of a host of examples, Rousseau was a Calvinist who didn’t believe in original sin, which is like being a Marxist who doesn’t believe in the alienation of labor. The paradoxes of Rousseau, however, are what make him a subject of lively debate in sociopolitical circles to this day and indeed what made this panel possible. Partly proving Gourevitch’s point while trying to counter it, Barber mentioned that Robespierre carried a copy of The Social Contract in his pocket during and after the French Revolution. “It’s not Rousseau’s fault that Robespierre behaved as he did,” Gourevitch replied, wearily. Chenevière and Keohane more effectively problematized Gourevitch’s stance by reading some pretty rad-sounding quotes from Rousseau’s writings. Gourevitch was having none of it: “Rousseau thought that the ideal form of government was a democracy of the aristocracy. He would be opposed to all trends in liberal thought today: multiculturalism, feminism, political correctness . . . ” Harsh, dude. Left: Amin Husain. Right: Pascal Couchepin, Pierre Maudet, and Guillaume Ceneviere. 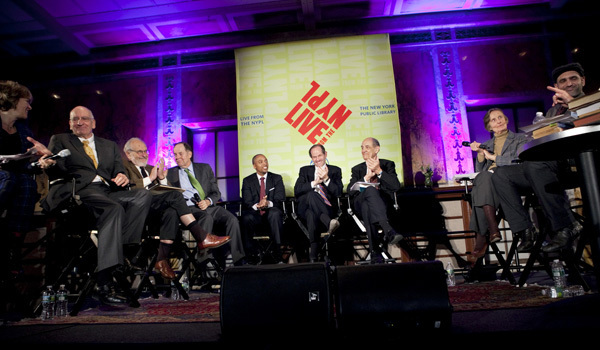 At that point, the former politicians were invited onstage: Eliot Spitzer, former governor of New York and, as its attorney general, the “Sheriff of Wall Street”; Thomas Kean, former governor of New Jersey and chairman of the 9/11 Commission; and Pascal Couchepin, former president of the Swiss Confederation. Couchepin said it was “dangerous to guess what Rousseau would have thought of this assembly. Democracy was a utopian concept that somehow succeeded.” He noted that American politics are now far more ideological than in Europe, implying that Europe had tried all the potential ideologies and sensibly realized that they all end up causing wars. For my money, Kean, the type of moderate Eisenhower Republican all but extinct today, delivered the quote of the evening: “We used to fight our own wars and pay for them—everyone was involved. We’re now doing wars by proxy. When everyone’s involved, you have less wars.” Word. With that, Barber opened the floor to questions. A line of academics, activists, and loons with blogs formed in front of a standing mic positioned in the middle aisle. Some asked wacky questions; others attempted to read manifestos or promote their websites. Most notable was a bearded young Occupier in a wool hat who relinquished his space in line to several people behind him. Asked why by Flanders, he said, “I saw a line full of white men, and I thought it was time for a woman to speak.” I pinched myself. I moved back to New York from the Bay Area in 1998 and now they have people like that . . . here? Impressive. Public Enemy’s “Fight the Power” boomed from the PA as people got up to leave. (“Anarchy in the UK” had played on the way in.) The PE was appropriate, less for Chuck D’s revolutionary lyrics than for the Bomb Squad’s dense sample collages, as the entire evening felt like a slicing, dicing, sampling, and repurposing of Rousseau’s thought to differing, at times perplexing, ends. All with Victor Gourevitch as the anti–Flavor Flav, a hype man in reverse who quietly debunked what everyone was saying instead of egging them on with a well-timed “Yeeaah, Boyeee!” The man can rock the mic—that is, when he knows where to point it.